There are a few terms that we use so here we go. We use this term to mean a drawer unit that takes hanging files. 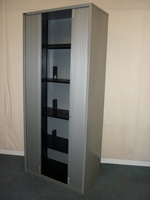 This picture shows a standard metal grey 4 drawer filing cabinet. There are also side filers which is the wooden one pictured. They are basically a standard filing cabinet side on. Roughly one drawer of a side filer equals one and a half drawers of a standard cabinet. We generally use this to describe a unit with doors. Normally double doors. They are generally cheaper than tambour doors and this is most pronounced with metal cupboards. If you are looking for the best value storage you can find, you cannot beat a metal double door cupboard. 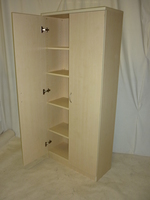 Most cupboards are between 800 and 1000mm wide. They are 400-600mm deep and the height vary from desk high to well over 2m. Make sure that you measure how high your ceilings are and allow a little extra as the unit will have to be lifted into place. This refers to the shutter type of roller door. This can either be one that you open from the top or from the side. A double side tambour is where you pull the shutters from both sides and they meet in the middle. These are simply combination units. They will normally have 1 to 3 side filer drawers at the bottom then either a cupboard or flip top units above them. The picture shows the green units that we use in our office. Put it simply, wooden cabinets are more expensive than metal. 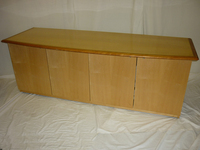 When it comes to tambour cupboards the difference is less pronounced. When looking at filing cabinets there is a large difference. 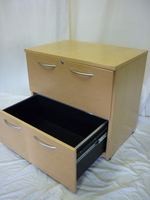 A decent wooden 4 drawer filing cabinet will be £300+ when new where as a metal one more like £140. The cheaper wooden ones tend to be cheaper for a reason and by the time we get them they are not great. So we don't see many. WHAT IS A ROLL-OUT FRAME? 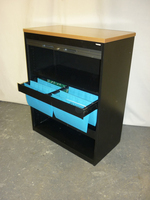 This is a frame that can be used for suspension files and fitted into a cupboard or tambour. It is pulled out and the files are accessed from the top. You can only go to about 1m from the floor (which is three frames) as otherwise it will be too top heavy. They are also designed to only fit the cupboard that the manufacturer makes so they can't be transfer between different manufacturer's cupboards. Finally they are pretty expensive new (approx £90 each) so we don't get many. WHAT IS A LATERAL RAIL THEN? This is also used for suspension files but it doesn't pull out from the cupboard. 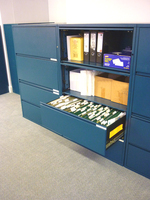 The files are accessed from the end but you can go up to the full height of the cupboard. They are cheaper to buy new but still not very common. To be perfectly honest, I am not exactly sure why it has a different name but it is a wider than normal desk high cupboard. Normally they have 3 or 4 doors and are used in meeting rooms. More often than not they are wood veneered and sometimes they have a built in fridge. When new adding the fridge can add about £600 to the price....Really!! Probably our most common question. Unless stated all cupboards with locks will be lockable but we cannot guarantee that we will be able supply the keys. If we have the keys then we pass them on but there are thousands of key combinations and often the keys are lost well before we collect the furniture. However we have a company that we recommend to get replacement and additional keys. If you look on the key hole you should see a number. Go to www.fastkeys.co.uk and put this into their search box. They are about £2.50 each and will be sent to you overnight. They are very good and highly recommended and it is much easier than us ordering them, passing the charge on and having to manage the process.